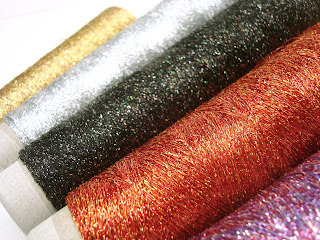 Kreinik's new metallic carry-along fiber is the world's softest sparkle. 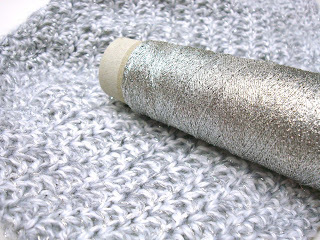 Add this 3-ply yarn to your crochet and knitting projects to make any design more interesting. Take a look at our before and after photo; just the simple addition of the metallic makes your base yarn more vibrant, with more texture, giving a touch of light and a spark of "special." 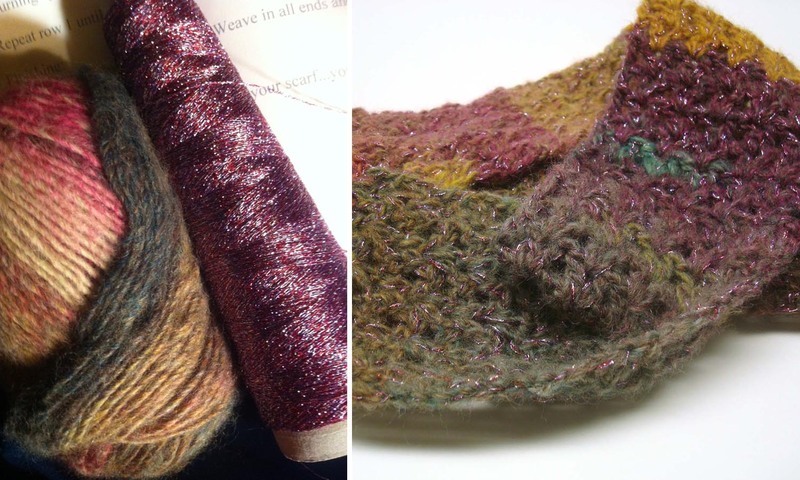 It elevates projects like a shawl, scarf, hat, or sweater from drab to beautiful. 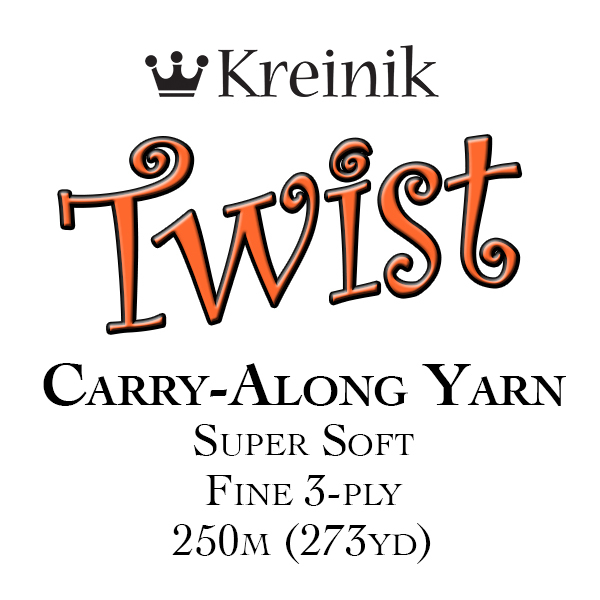 And the best quality about the new Kreinik Twist™? You get the added "spice" without adding weight or scratchiness. Available in the prettiest range of introductory colors, the lightweight metallic is hand and machine washable, and dry cleanable. Our designers found that it works best with lace-, sock-, or light-weight yarns, but feel free to experiment with it using any yarn in your stash. 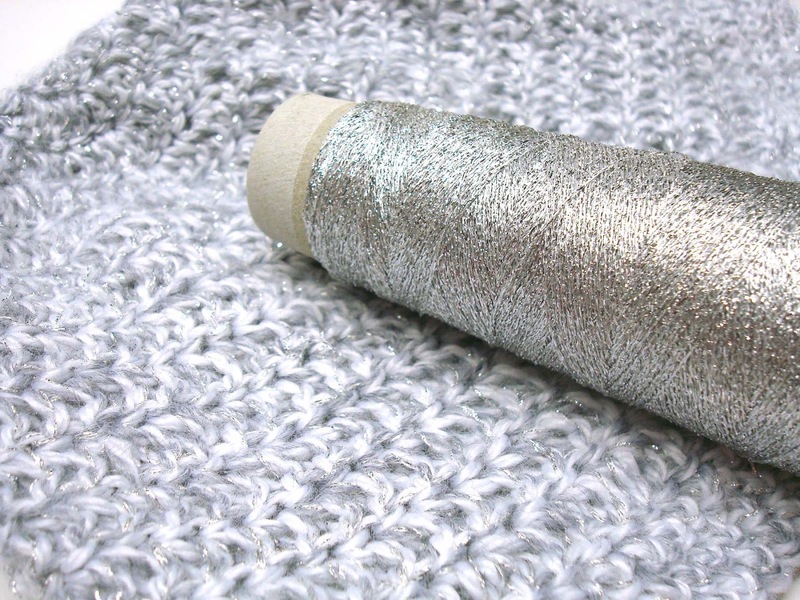 Even an ugly yarn can be transformed with a little metallic. Made in West Virginia, the new Kreinik Twist comes on 250-meter cones. It is available in Silver, Gold, Black, Chartreuse (Lime), Teal, Berry (Purple/Pink), Brown, and Red/Orange. Don't let the plain color names fool you; these are gorgeous shades that coordinate with every yarn. On the cone they look vibrant and bold, but when used as a carry-along, they add color without being glaring or glitzy, offering subtle effects. If you think metallics aren't for you because they are too blingy, this is the metallic to try now. You will be amazed at the softness and quiet elegance it adds. We're not just saying that; we've knitted and crocheted with it and amazed ourselves. This is a fun new yarn that will do wonders for your designs. The next time you are stitching a project and think "Something's missing…" this could be the solution. 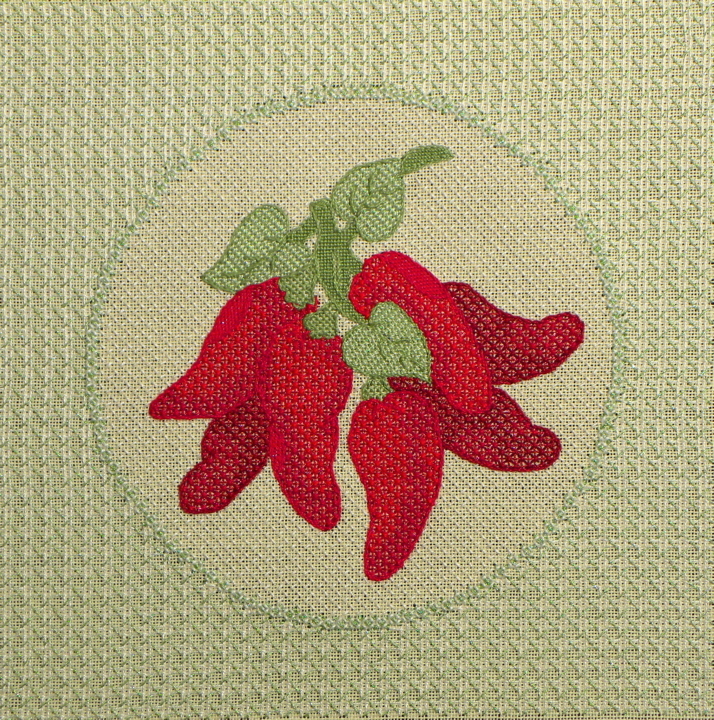 The new Kreinik Twist™ debuted at the TNNA Columbus needle arts trade show June 22-24, 2013. Look for it in stores soon, or from you favorite online thread resources. 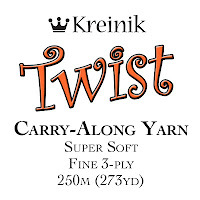 You can also find it at http://www.kreinik.com/shops/Twist.html. Colors: Silver, Gold, Black, Chartreuse (Lime), Teal, Berry (Purple/Pink), Brown, and Red/Orange. Care: Hand and machine washable, dry cleanable. Tumble dry on low or hang to dry. New designs using Kreinik threads are frequently posted on our Facebook page, eliciting "oohs" and "aahs" along with "Where can I buy that pattern?" One needleworker raised a common question when she wrote, "Can a cross stitcher do this?" 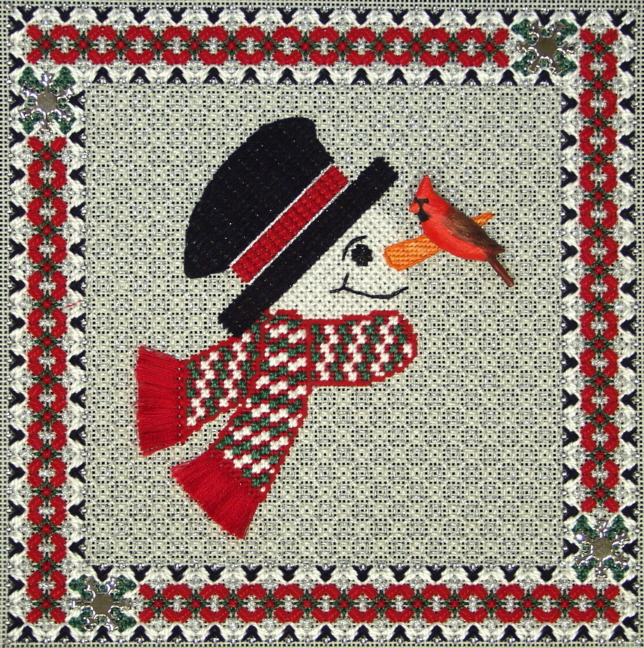 in response to a gorgeous Frosty Friends charted needlepoint design by Ann Strite Kurz. We asked Ann for a teacher's point of view to answer the question, "Can a cross stitcher do counted canvaswork?" First, let's differentiate counted canvaswork from painted (or printed) canvaswork. A glance at Wikipedia notes that "Needlepoint is a form of counted thread embroidery in which yarn is stitched through a stiff open weave canvas…"
"In hand-painted canvas, the design is painted on the canvas by the designer or painted to their specifications by an employee or contractor." "Printed canvas is when the design is printed by silk screening or computer onto the needlepoint canvas." "Charted canvas designs are available in book or leaflet form…Charted Canvas designs are typically printed in two ways: either in grid form with each thread intersection being represented with a symbol that shows what color is meant to be stitched on that intersection, or as a line drawing where the stitcher is to trace the design onto his canvas and then fill in those areas with colors listed." In very basic terms, counted canvaswork is needlepoint done from a chart, and painted canvas is needlepoint with the image already on the canvas. 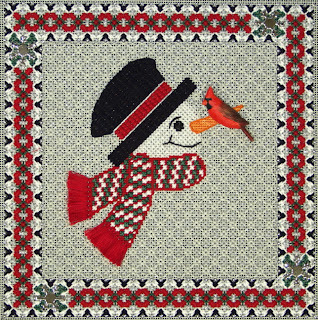 Charted designs are less expensive than painted canvas, so for many people, it is an economical way to experiment with needlepoint. Since counted canvaswork is based on a chart, you can already see that cross stitchers would be comfortable with the format. "Some of my best [charted needlepoint] students started in cross stitch," Ann tells us, "and they have much more patience with some of the precision in my work than canvas fans who prefer the freedom of painted canvases. The reason is that they are fluent at reading charts so they adapt well to doing texture stitches other than crosses on a grid." Texture stitches? 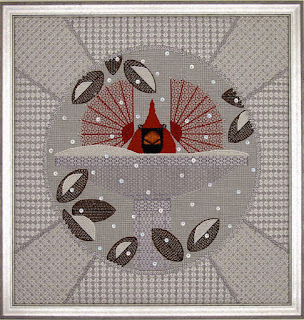 Now we are getting into what really separates charted needlepoint from charted cross stitch: there are many more stitches and threads used to create the stunning visual effects of charted canvaswork. "Another part of the education," Ann notes, "is learning to use a lot of today's novelty threads, but this is also part of the fun since so many special effects can be achieved with them." Charted designs can be intimidating to some because they have so many stitches and look complicated, but good charts come with detailed stitch diagrams, numbered so you can follow the sequence. You are still following a chart, still counting out rows, counting up and down, but you have added a greater variety of fibers and stitches. That is what makes the finished project so fun and exciting. If you ever made a string art design in elementary school, you know what we mean: the lines are harmonic, the colors are rich, the layers are dimensional. It's just fun to create this kind of fiber art. 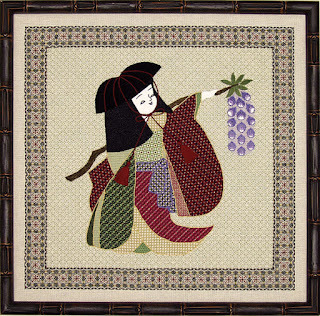 If you are a cross stitcher falling in love with a counted canvaswork pattern, don't be afraid. The answer is: Yes You Can Do It. It's something different, a new way to use stitches and threads, to create embroidered pictures, and to express your creativity. Find a teacher at your local needlework store, online classroom, or through a needlework guild. 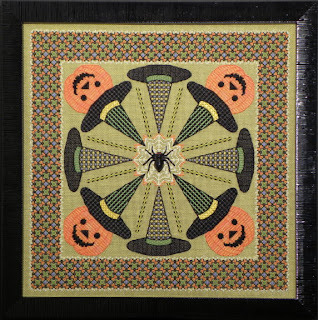 Visit the Ann Strite Kurz section on www.needleartworks.com to see both her simple and her complex designs. Ann also teaches at ANG and EGA meetings in the US, so check their web sites for schedules. 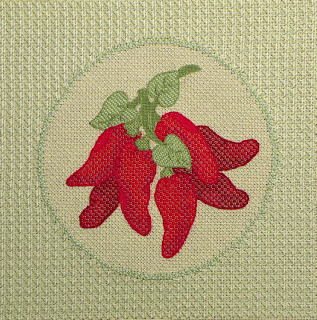 Side note: Cross stitch is basically fabric embellishment technique, as stitches are created on fabrics. Needlepoint is a fabric creation technique, as stitches and threads work with an open canvas to actually create a fabric. Most often, we keep the two categories separate (technically, economically, culturally). Estelle Kreinik, however, was very fond of reminding people that the cross stitch is often used in needlepoint. Both techniques, in fact, share common threads.